In October 2014, Groupe Germain Hospitalité – a family-run business in Quebec City that owns and operates 10 ALT Hotels and Le Germain Boutique-hotels across the country (with four more currently under construction) – announced plans to build an ALT Hotel in Calgary. Fast forward to November 2018 and the hotel has opened its doors to extend the company’s innovative “no-frills-chic” concept to East Village. Building on the success of Hôtel Le Germain Calgary, ALT Hotel Calgary offers stunning views of the Bow River and downtown Calgary from its location at the corner of Confluence Way and 6th Avenue SE. 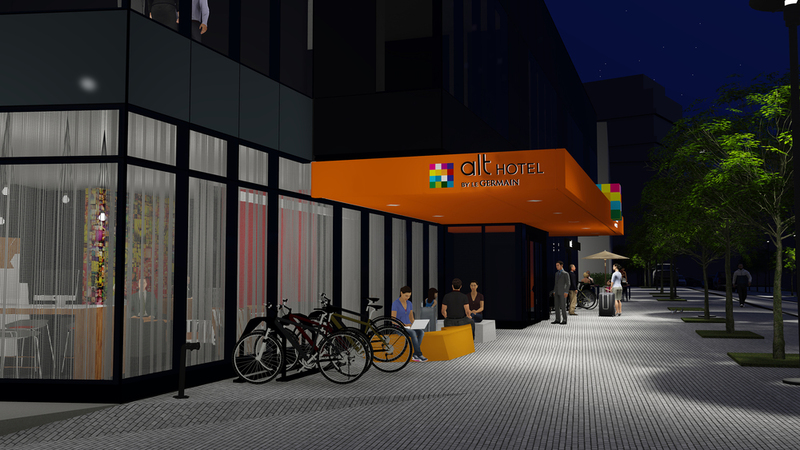 Designed by LEMAYMICHAUD Architecture Design and developed in partnership with local builder Homes by Avi, the 11-storey Alt Hotel Calgary will have 155 rooms and 5,000 sq ft of meeting space. The hotel opened November 15, 2018 with a grand opening scheduled for Q1 2019.